You are here: Home » How to Setup Your Magicjack Voicemail? Congratulations on buying the most cost-effective voip home phone service that is Magicjack. We switched to Magicjack years back and have never looked back. It is in fact fabulous to pay just $20/year for a home phone line and save hundreds of dollars in phone bills. One of the first things to do with your new Magicjack voip number is to setup your voicemail. 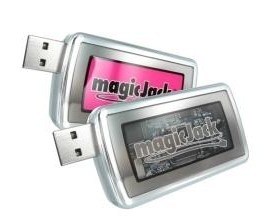 You can call your Magicjack number or press the VMAIL button on the Magicjack software. When you hear the automated voice, press the * key. If this is the first time you are here, just enter the default password 1234 or enter your password. Now, Press 0 for mailbox options. You now have 3 options. You can now listen to your recording and then accept or re-record your greeting. Now, just hang up or press * to go back to the main menu. That’s it. That’s how you set up your Magicjack voicemail. One thing that irks me about this service is that there is no magic jack customer service phone number. You can only do a live chat with them. Do you have your own tips and tricks regarding Magicjack? Give me a shout out on twitter @KIntheHouse or on ShanKrila facebook page.